BARCELONA, Spain--(BUSINESS WIRE)--Today, Husqvarna announced the release of Husqvarna Automower® 435X AWD, an AI-enabled, robotic mower with all-wheel drive and smart home connectivity. 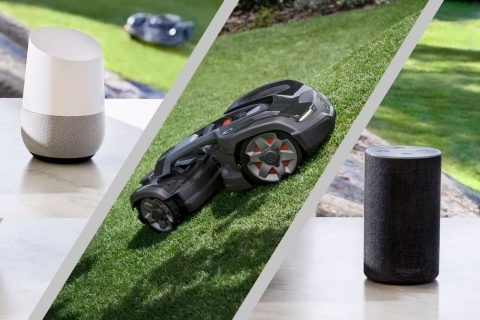 This iconic, fully autonomous robotic lawn mower is designed to manage rough terrain and slopes with an incline of up to 70%, and works with Amazon Alexa, Google Home, and provides an open API for smart home integration. 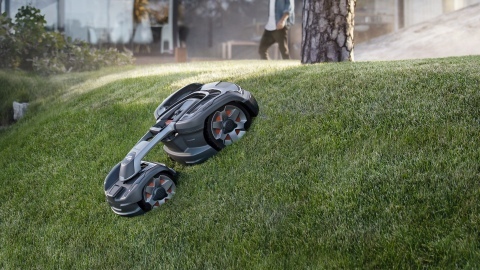 Husqvarna, the world leader in robotic mowers, launches a game changing robotic mower for homeowners with challenging lawns and connected homes - Husqvarna Automower® 435X AWD. With an all-wheel drive system, Husqvarna Automower® 435X AWD robotic mower can climb steep slopes with an incline of up to 70%. “Husqvarna Automower® 435X AWD sets a new standard for robotic mowers, combining a perfect cut in “impossible gardens” with multiple product interactions, including conversational AI for Amazon Alexa and Google Home integration,” says Olle Markusson, Director Product Management at Husqvarna. Starting this spring, Husqvarna Automower®435X AWD, and all other Husqvarna robotic mowers with Husqvarna Automower® Connect, will be able to use voice commands via Amazon Alexa and Google Home. Advanced users can design their own program for the robotic mower via the open API. In addition to the built-in safety feature that automatically stops the mower if it is lifted up or turned over, Husqvarna Automower®435X AWD is also equipped with several new features to increase safety. With Ultrasonic, a remote object detection feature, Husqvarna Automower® 435X AWD reduces its speed as soon as it senses a nearby object. Husqvarna Group is a global leading producer of outdoor power products and innovative solutions for forest, park and garden care. Products include chainsaws, trimmers, robotic lawn mowers and ride-on lawn mowers. The Group is also the European leader in garden watering products and a global leader in cutting equipment and diamond tools for the construction and stone industries. The Group’s products and solutions are sold under brands including Husqvarna, Gardena, McCulloch, Poulan Pro, Weed Eater, Flymo, Zenoah and Diamant Boart via dealers and retailers to consumers and professionals in more than 100 countries. Net sales in 2018 amounted to SEK 41bn and the Group has around 13,000 employees in 40 countries.